Jahkal's review"For studio? Yes. Live? It depends." 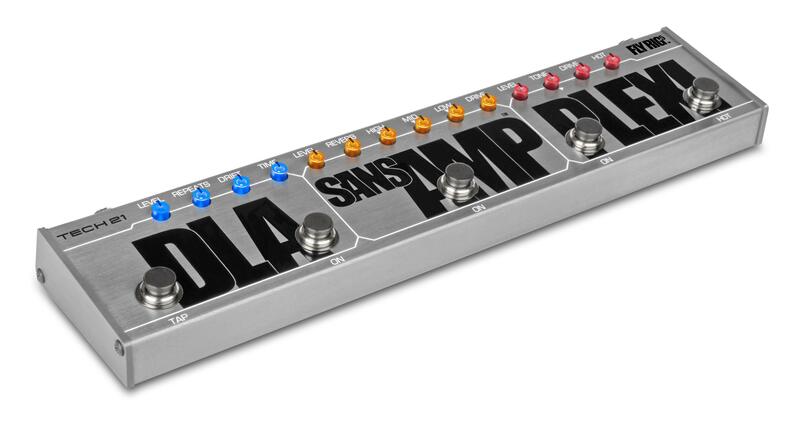 It's a pedal with a built-in Sansamp, meaning a preamp with speaker simulation, plus a delay, a Plexi simulation and a 21dB boost. It's analog, with very sensitive controls, all of which have a real impact on sound. I use it live with a mixing console. So the Sansamp and the speaker simulation must always be active. The controls are a bit small for live editing, besides being very sensitive. Simple and clear manual with sound examples. The Sansamp part is great. You really have the impression of listening to a very good tube amp, some of which don't even sound as good as this pedal, at least, to me. And it has a reverb, which many tube amps don't. The clean sound is quite all right. Increasing the drive you can get a light and very nice crunch. Everything is very responsive to the volume pot on the guitar. I use it with a Mexican Telecaster. The Sansamp part is truly interesting. But that's something I already knew, since I have already used similar Tech21 products. The Plexi sound is very... Plexi. You can really hear that fat Hendrix tone. A simple F#m7 on the 9th fret and, voilà, Foxy Lady is in the house! But that might be it's biggest defect. The sound is huge, apocalyptic, and a bit muddled when strumming the lower stings. Furthermore, the mixer input level is not very high. 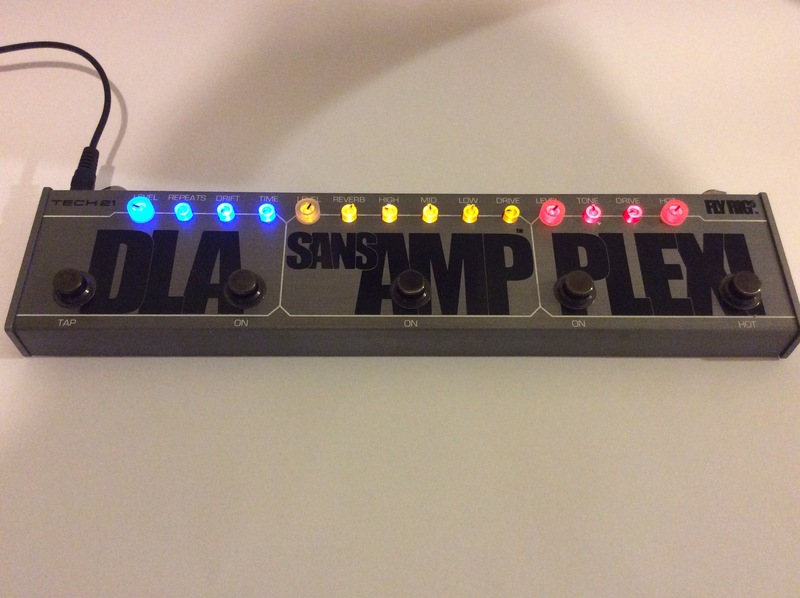 The delay is convincing and you can even get a chorus, depending on the settings. The boost... boosts, but it lacks a bit of oomph when the Sansamp + Plexi are engaged. I think it's more convincing only with the Sansamp. It's a good all-in-one pedal. However, it doesn't quite suit my rhythm playing. This pedal has a big personality, but in my view as someone who is not good enough for solos and plays rhythm guitar in a band, it's not sharp enough, it's too fat, with lots of lows. It will probably do the trick for a '70s-like band with only one guitar player, but not for me. You really need to test it under the conditions you are going to use it. At home it was very good. I tested it live with another guitarist and I wasn't really convinced by it. 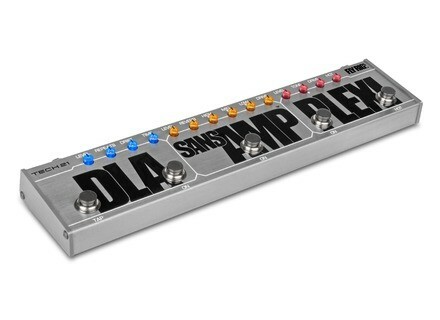 I'm actually looking for an amp head in pedal format. On paper it's pretty convincing. In reality...I'll keep my AMT M2, which sounds really good. 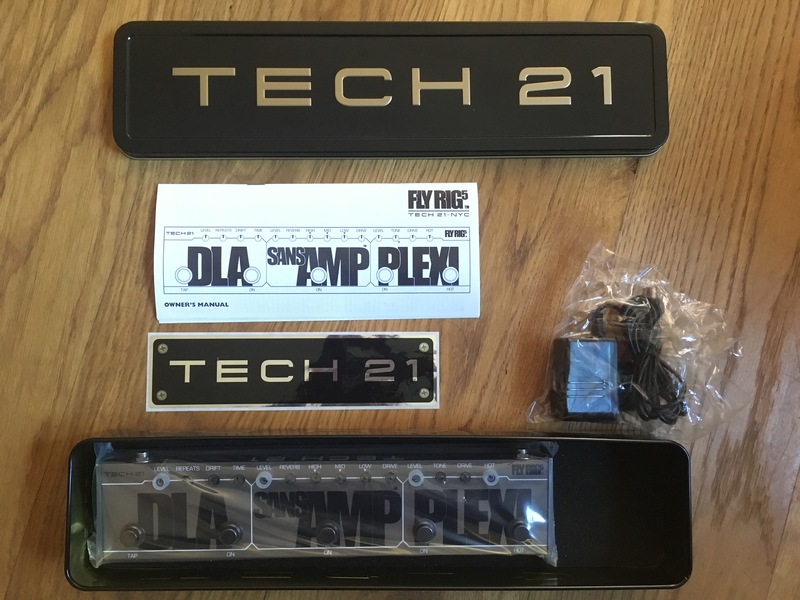 bbhack's review (This content has been automatically translated from French)" Hmm ...."
I think the feature has already been mentioned on AF and if everything is on http://www.tech21nyc.com/products/sansamp/flyrig.html. Everything could not be more simple. The only problem I can find is still the size of the knobs, but bein heard to compact you can hardly do better. 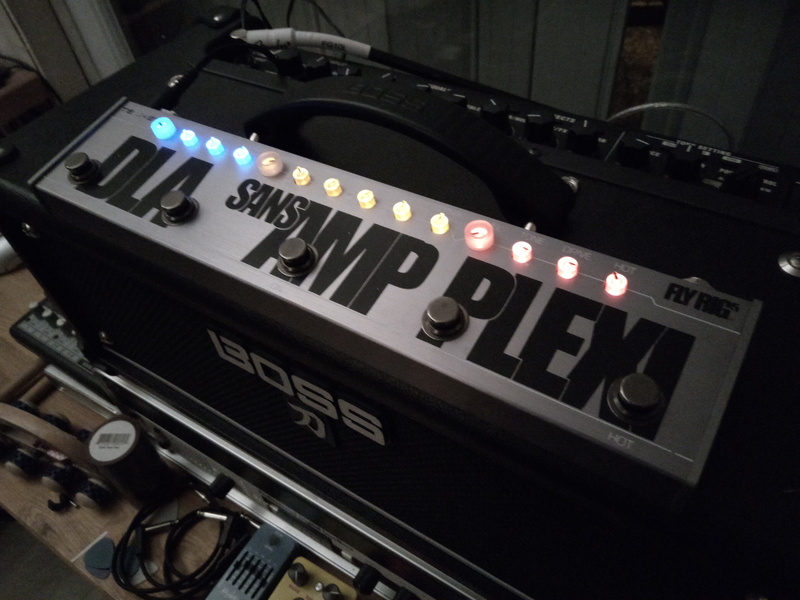 Great being able to combine SansAmp / plexi / delay and reverb side SansAmp. It gives many combinations at the feet (or hands if we are home stud). Then I found that the account is not there unfortunately . The reverb is very valuable even if I find a hair courte.Le delay is fine, probably the most successful side of the pedal. The plexi part left me very skeptical. In small doses it happening is very very nice for a sound a bit like srv, but when you go up it gets a little rough very quickly. It reminds me of the filthy old Fender blackface push the sound plexi saturation, but I'm not expert on the subject. In fact I find her much more fun if we disregard the plexi part to paste a pedal od upstream. Note that I have used in my house with a chain correctly without professional sound so far (sound card and two small 6i6 Focusrite Fostex pm5), with my two favorites, and a telecaster baja 339 es and OCD Fulltone upstream. 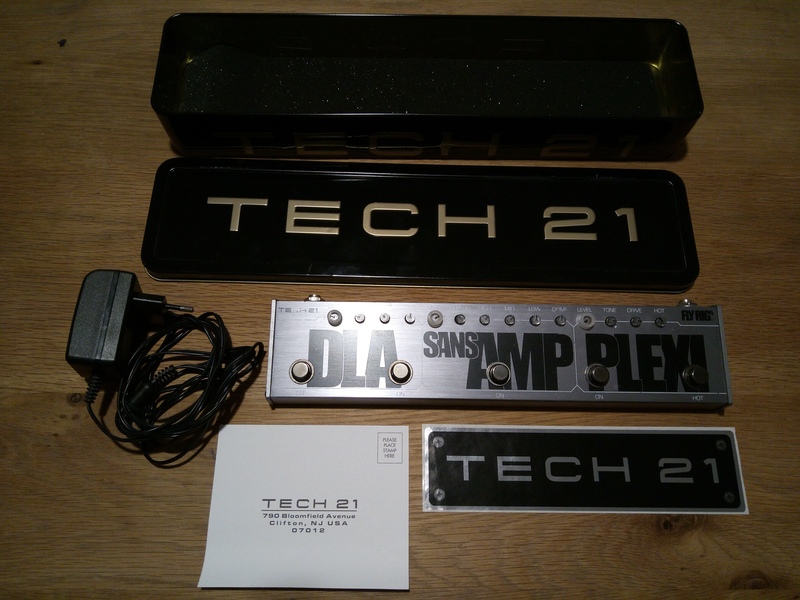 I admit I bet a lot of hope in this little gizmo because I know Tech 21 SansAmp since 1 in '92 to more recent creations (GT2, Blonde, amps Trademark). So I was disappointed at the height of my hopes . In fact I find this very nice little pedal, practical and highly innovative. However it should still not ask him too. Certainly it sounds very decent, much better than 98% of hard and soft digital simulation. As against this is far from the promise put forward: 'Get 5 "must-have" gigging pedals for the third cost at 1/3 the size, sans pro Sacrificing quality tone.' Certainly it is marketing but generally at Tech 21 there was little difference between marketing and reality. The well was 3.5 effects but not without sacrifice of quality. For use home-studio owner not too demanding is fine, but otherwise, I think it does not do too much ... For my part, I kept qq days, the time to shop around and see that it did not suit me. Here is a presentation of the new Fly Rig 5 multi-effect at the Tech21 booth at NAMM 2014.